"Nor can any intelligent person make good or relevant sense of it in the modern world – it is just a fantastic, impossible concocted story of the 'Superman' kind – with 'monkey-man' Hanuman lifting and flying aloft with a whole mountain (so Rama could pick out a herb from it!) or jumping across the sea to Sri Lanka. Come on, how can one be so backward intellectually? This may be o.k. for ignorant peasants, but the thinking world must regard it as sheer delusion!" Did you get that Sanjay? Come on, how can one be so backward intellectually? This may be o.k. for ignorant peasants, but the thinking world must regard it as sheer delusion! The reason why this is so amusing is because Sanjay is a Hare Krishna Congregational Member who happens to be one those "backward intellectually" "ignorant peasants" who believes in "impossible concocted stories of the 'Superman' kind"! That's right, Sanjay fully believes that the Ramayana, Bhagavad Gita and Srimad Bhagavatam are Divine Scriptures that document literal and historical miracles, lilas, manifestations and paranormal events in the lives of Avatars (incarnations of God). Sanjay fully believes in the "superman" miracles and stories attributed to Lord Ramachandra, Lord Krishna, Hanuman (the Monkey God) etc. As a matter of fact, Sanjay engaged me in a fierce debate in which he defended his belief that Lord Krishna literally manifested 16,000 human forms, married 16,000 separate wives and procreated with each one of them producing innumerable offspring! What makes this even more weird is that Sanjay is a staunch defender of the same people (Priddy & Pittard) who openly mock his religious beliefs! This is not the first time that Robert Priddy bashed Sanjay's religious beliefs. Priddy formerly bashed Sanjay as being: "One of those many ignorami who sustain and spread false beliefs about the powers of black magicians and witches." See For Yourself. Niiiiiiice friends you have there, Sanjay. 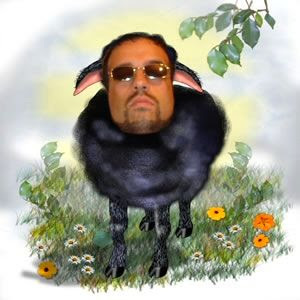 Sanjay is the black sheep of the Anti-Sai Movement. Keeping in character with his outcast role, Sanjay bleets "Baa Baa" "Baa Baa", obsessively tracking Sathya Sai Baba-related news so he can twist it for his Anti-Sai friends who use him and his big mouth for their own nefarious ends. If you believe in God then why couldn't he do all those simple things if He created ALL that exists! And if not then go do something else with your time.